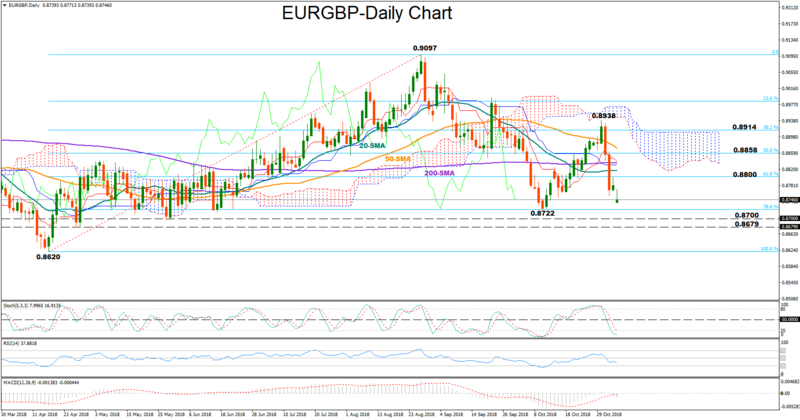 EURGBP opened with a gap down on Monday near one-month lows and is currently trying to restore its losses. Negative risks however remain in the background as the MACD increases momentum to the downside and below its red signal line. The RSI is also in bearish territory but is close to its 30 oversold threshold, hinting that an upside correction is possible. The latter is also supported by the Stochastics which are heading for a bullish cross below 20. Should the market stretch north, immediate resistance is expected to come from the 61.8% Fibonacci of the upleg from 0.8619 to 0.9097, near 0.8800. A break higher would shift focus to the 50% Fibonacci of 0.8858, which tried to halt both downside and upside movements several times in the past. Above that, investors would be interested to see whether bullish dynamics can overcome the previous peak of 0.8938 which is located slightly above the 38.2% Fibonacci of 0.8914. On the other hand, a decline in the price may retest 0.8722, the low on October 10 and the 78.6% Fibonacci before meeting support between 0.8700 and 0.8678. Further down, the next stop could be at the 0.8619 bottom, where any violation would resume the downleg off 0.9097. Turning to the medium-term picture, the market continues to trade in a downtrend since August 28. But hopes for a bull market are weakening as the 50-day (simple) moving average (MA) is moving downwards to drop below the 200-day MA, while the 20-day MA has already crossed below it.